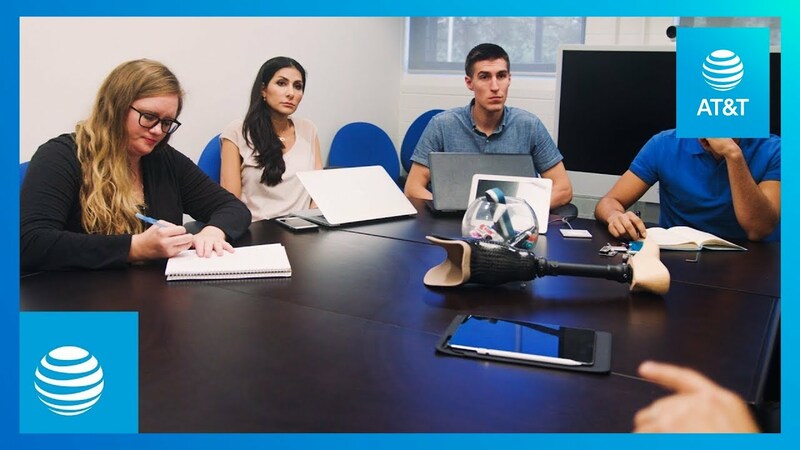 AT&T* and Hanger, Inc., a leading provider of orthotic and prosthetic patient services and solutions, have developed a trailblazing proof of concept for the industry’s first standalone, network-connected device for prosthetic limbs. The prototype, designed to attach to below-the-knee prostheses, is simple and highly mobile as it syncs directly to the cloud via AT&T’s network without relying on Wi-Fi, Bluetooth, or a separate mobile device. This connectivity allows Hanger Clinic, the patient care subsidiary of Hanger, to receive data on patients’ prosthetic usage beyond the clinical setting. Equipped with these insights, Hanger Clinic clinicians can proactively contact patients to address potential issues impacting prosthesis usage, such as fit and comfort, to in turn increase mobility. Physical mobility is intrinsic to our everyday lives – running, bathing, dressing, driving. Now imagine losing a limb. When professional acrobat Andrew “AJ” Montgomery underwent a below-the-knee amputation following a motorcycle accident 3 years ago, he didn’t just have to re-learn once-instinctual movements. He also faced the uncertainty of continuing his acrobatic career with a prosthesis. “After my amputation, I wasn’t sure how to tackle my life – where I’d left off, where I’d be going,” Montgomery said. Those experiencing limb loss face an unfamiliar journey to finding their way to restored mobility. Some who don’t know where to begin might not communicate their challenges with their prosthetic clinicians, potentially leading to lack of use of their prosthesis. But what if the prosthesis could talk directly to the patients’ caregivers? If this data feed could be relevant, automated and more detailed, caregivers could provide patients with better, targeted assistance. The AT&T Foundry, which is designed for collaborative innovation projects just like this, was the ideal venue for this venture with Hanger. The resulting prototype is designed to collect data on prosthetic usage and mobility in near-real time. The device is connected via AT&T’s LTE-M cellular network, and has an accompanying interactive mobile app. Getting to an intuitive, seamless prototype required a flexible and nimble design process, collaboration and rapid iterations, which is how the AT&T Foundry approaches all its projects. In this case, combining an accelerometer, gyroscope, magnetometer and an LTE-M modem into a compact device resulted in multiple test versions of the prototype. With each version we provided new information – where to install the different components, how to balance the weight to make the prosthetic device comfortable with the prototype, the best way to capture and transmit data about speed of motion, impact force, direction, rotation, and more. In the span of just a few months, we’d gone from a concept to a prototype that was ready for real-world testing. To put this data into action, we also prototyped an iOS app equipped with patient and clinician portals. The app will allow patients to view their day-to-day progress, such as number of steps taken. It also includes a video calling feature so patients can talk with Hanger Clinic providers about potential issues with their device. Likewise, clinicians can view their patients’ activity levels and contact those whose user data shows low activity or irregularities. Hanger is currently trialing 5 of these devices with existing patients. In the coming months, Hanger and AT&T will continue to take the best components of this proof of concept to create a fully functional product for the next phase of this project.